Quito, a UNESCO city and the capital city of Ecuador has lots to offer. From the colonial architecture, many incredible viewpoints, modern cable car TeleferiQo to museums and Mitad del Mundo. 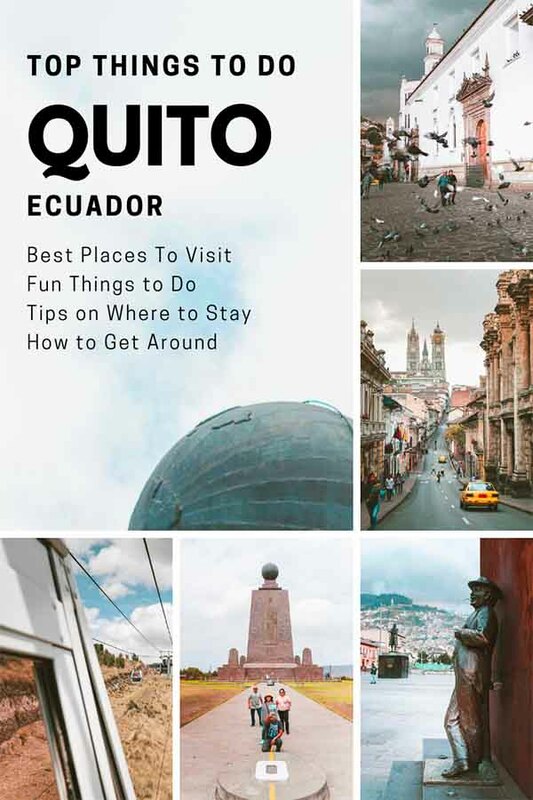 We bring you a comprehensive travel guide with top things to do in Quito, advice on where to stay and how to get around the city. When looking for the best things to do in Quito, we came across many recommendations and safety concerns in the Ecuadorian capital. Although it is still not recommended to walk in dark alleys lightheaded, you should watch your belongings all the time, especially in the crowded public transport and essentially use your common sense, don't let crime to spoil your trip as walking around the city's beautiful architecture shouldn't be missed. Do you have a feeling that walking in the streets of Quito leaves you breathless? Nestled high in the Andean foothills in 2850 meters above sea level and surrounded by volcanoes, Quito is the second highest capital in the world! Spend here a few days (try not to drink alcohol as it doesn't help with acclimatization) and you should be fine and ready for your Ecuadorian adventure. Quito is a wide-spread city which lies only about 20 km from the equator - this trip to the Mitad del Mundo will probably take you the longest, but if you plan on staying somewhere in the Old Town, La Mariscal or La Floresta area, you should be able to explore Quito on own mostly on foot or with a bit of help from the public transport, which is quite easy to use. Quito also serves travelers as a perfect base for organizing tours to nearby mountains or more often as a few days stop before their flight to Galapagos Islands. Either you plan to travel in Ecuador independently or will use an organized tour, here are top things to do in Quito you can't miss. It is not possible to be Quito and not to visit its biggest attraction. Mitad del Mundo is the most visited site in the whole of Ecuador. The massive monument only 20 km from Quito marks the equator, the middle of the Earth and although the latest measurements proved that the equator doesn't lie exactly here but in the place approximately 240 meters more south plus the equinoctial line is actually a strip that is 5 km wide and the GPS position 00°00’00” constantly moves within this strip, who wouldn't like to have a picture while standing with each leg on a different hemisphere? There was a whole tourist village built around the Mitad del Mundo monument, and apart from a museum within the monument itself, you'll find here some other museums, planetarium, ancestral village, and many restaurants. The entrance fee is $5. To get to La Mitad del Mundo, you can either take a taxi, an organized tour, but the cheapest way how to visit is to take public transport. No matter where in Quito you stay, hop on the bus going to Ofelia bus station. It is on the outskirt of the city, and the ride takes an hour, the ticket cost $0.25. From Ofelia take another bus from the first platform going to Mitad del Mundo, it takes another approximately 40 minutes and cost $0.15. Quito's Old Town is compact and pedestrian-friendly. Declared a World Heritage Site by UNESCO in 1978 for its well-preserved historical center, beautiful colonial architecture, and many incredible churches, the Old Town is a place where you will disconnect from the crowded public transportation, omnipresent street noise and shouting of vendors. Quito was founded in the 16th century on the ruins of an Inca city and until now has the least altered historic center in Latin America. Most of the sites are close to each other, so no worry you would accidentally skip something. You can start on Plaza Grande, also known as Independence Square, then you can continue to the gold church La Compania de Jesus and to one of the Quito's most notable squares Plaza San Francisco where also stands Roman Catholic San Francisco Church. We won't bore you with naming every single one church and plaza which is worthwhile the visit, hopefully, some of our photos of the old town will give you an idea about this remarkable place. Every capital city boasts with museums and Quito is no different. On one rainy day, we decided to visit Capilla del Hombre & Museo Guayasamin. The museum shows the work of the most famous artist of Ecuador and, by extension, one of South America's most important artists of the modern era. We must admit, that before visiting the museum, we've never heard the name Oswaldo Guayasamin, but we became admirers of his paintings immediately. Guayasamin focuses in his work (among other things) the suffering of indigenous people, what a surprise that one of his pictures is dedicated to the suffering of people from burned out the city in the Czech Republic, Lidice. The collection is in a remarkable monument-like building which was finished after Guayasamin death. The other building you can visit is the artist's former. Apart from the building which is remarkable on own, there is also a museum and a collection of objects Guayasamin bought or received during his life. The admission to the museum and the private house is a bit steep for Ecuador - $8, but it includes a guided tour (in Spanish or English), and after experiencing both parts, we agreed that those $8 were well-invested. From the central bus stations, take a bus going to Ecovia and get off at Bellavista station. From here, you must walk about 15 minutes uphill (there might be some other bus going closer to the museum, but we didn't want to change lines). Traveling in Quito by public transport is a challenge on own, and if you can't withstand overcrowded spaces, we recommend to take a taxi instead. A famous pedestrian street La Ronda lies in Quito's historic district. In the 19th century houses in the street became gathering places for poets, writers, painters, sculptors, singers and also political activists. Later, the area struggled as it was home for a Quito's drug scene and prostitutes, but thankfully in the late 20th century, the city's tourism board decided that the street needs restoration in order to attract more visitors. Nowadays, Calle La Ronda can remind you streets in Spain or other cities with a Spanish architectural influence. Calle La Ronda is traffic-free and in the houses along the street are many restaurants, galleries, artisan shops and also educative boards about a colorful history of this street. Quito lies 2850 meters above sea level, but around the city are many mountains from where you can get spectacular views over Quito and the landscape around. One of the best places to get views not only of the wide-spread city but also of other volcanoes in the near surroundings is to take a cable car up to the east side of Pichincha Volcano. The TelefeQo cable car will take you to 4000 meters and from here you can either take a hike to Rucu Pichincha, bike down the slope back to Quito, or lazily walk around, enjoy the views and maybe swing back and forth above clouds. We did the TeleferiQo ride only one day after we came back from the Galapagos Islands and we could feel the altitude. It is better to acclimatize in Quito for at least two days before going up. To get to cable car by public transport, take a bus to Colon station (from our station Santo Domingo, we took C4 line). Get off at Colon station and take another bus going to La Comuna. Tell the driver where are you heading or he will announce TeleferiQo station. From here, you must either walk about 1km uphill to the cable car entrance, or you can take a taxi for $1. The cable car ride takes 18 minutes and costs $8.50. As we already mentioned, there is mountainous landscape everywhere around Quito, and it is easy to choose one point from where you want to overlook the capital of Ecuador. If you don't want to ride a cable car and go further from the center, you can walk to easily reachable viewpoint Virgen de El Panecillo. The stone monument on the hilltop is hard to miss - to get there, follow the street climbing uphill. To get one of the most renowned and postcard-like views of Quito, you must climb to a tower of the Basilico del Voto Nacional. It is the largest neo-Gothic basilica in the Americas, and although it looks nice from the outside, we believe that it is worth it to spend $2 to climb the tower. There is a separate entrance fee to get to the ground floor of the basilica, but if you want to climb the tower, you will see the inside anyway, only from the first floor. You will need a good stamina for heights climbing the last ladder, but it is nothing too terrifying what should stop you. The public transport in Quito is inexpensive, one ride cost $0.25, but the orientation is a bit harder. We found the best always ask in our hostel and the locals always helped us with directions. There are three different types of public transport: El Trole, Metrobus and Ecovia, the subway system is currently being built. If you stay in the center, the closest transport hub is La Marine station, from where is easy to get almost everywhere outside the center (for example to Mitad del Mundo, Guayasamin Museum or TeleferiQo). To get around the center, we preferred walking. The only downside of Quito's public transport is how unbelievably crowded it is. It seems that people never get off and there is only more and more getting on. Add several vendors and beggars who try to earn some money and also the unpleasant tradition that people don't wait for others to disembark and you must fight your way out. And funny thing - buses are sometimes longer than stations, so if you stand in the back part of the bus, it can happen you won't get out where you intended. There is no shortage of accommodation in the center of Quito. We stayed on Santo Domingo square in Hostal Juana de Arco. This well-run hostel was our base before and after our trip to the Galapagos Islands, and it had everything we needed. Breakfast is included, there is also a kitchen for guests' use, and we could leave our stuff there for a week.